Today marks the end of QE2 so naturally there are many discussions about its usefulness. A few examples: Real Time Economics1, Real Time Economics2 and Mark Thoma. To gauge the success of a policy, it has to be measured against the policy goals. Although QE2 did stimulate economic activity, the primary goal was to prevent deflation, as Fed Chairman Ben Bernanke made abundantly clear in his last press conference. By this measure, the program was a smashing success. Inflation expectations — as measured by 10-year inflation-protected Treasury securities — had plunged to 1.49 percent before the Fed’s actions last fall, and subsequently rebounded as high as 2.64 percent. “I believe it is quite accurate to say that many of us were concerned last summer about the danger of the U.S. repeating the Japanese experience, that those concerns have since been reduced, and that the stance of the Federal Reserve is one reason those concerns have been reduced. This does not mean that the Fed solved all our problems, and I never believed that it could. But I believe the Fed did avoid making our problems worse”. prosperity” – coming to the fore. A “better prosperity”? What does it mean? But nothing that could be described as such happened because just as Palyi´s ink was drying the economy nose-dived into the second leg of the depression. So, BIS, OECD, ECB, Fed, Congress, etc. BEWARE! U.S. households during the 1920s acquired a vast amount of debt and began a deleveraging process during the Great Depression. Consequently, there was a “balance sheet” recession in the 1930s too. Monetary policy, however, was not impotent during this time. At least when it was done the right way. 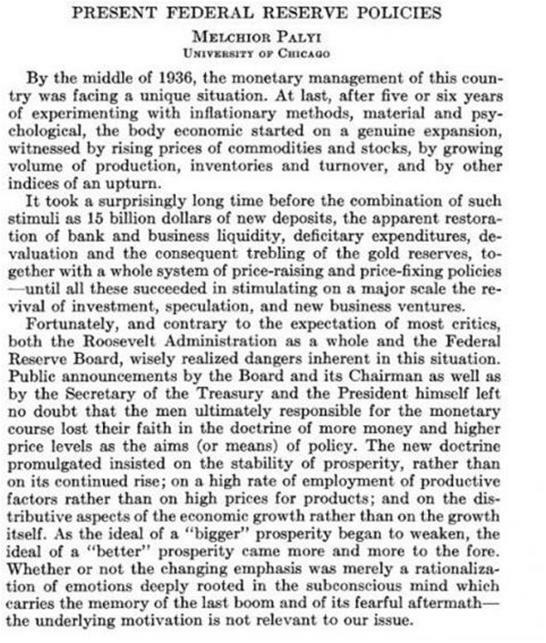 FDR’s price level targeting from 1933-1936 sparked a robust recovery. …Yes, deleveraging is a drag on the economy, but for every debtor deleveraging there is a creditor getting more payments. (And if the debtor is not making payments and defaulting then the debtor still has funds to spend.) In principle the creditor should increase their spending to offset the debtor’s drop in spending. The reason they don’t–creditors sit on their newly acquired funds from the debtor instead of spending them–is because they too are uncertain about the economy. There is a massive coordination failure, all the creditors are sitting on the sideline not wanting to be the first one to put money back to use. If something could simultaneously change the outlook of the creditors and get to them to all start using their money at the same time then a recovery would take hold. Enter monetary policy and its ability to shape nominal spending expectations. So I’m not clear why Beckworth needs to invoke some other story about coordination and all that. There is still a sufficiently low real interest rate that would produce recovery, but it’s a rate that’s hard to achieve. Much has been said of late about Federal finances and inflation, the gold standard, etc. Let me make the facts very simple and my policy very clear. In the first place, Government credit and Government currency are really one and the same thing. Behind Government bonds there is only a promise to pay…in the past the Government has agreed to redeem nearly thirty billions of its debts and its currency in gold, and private corporations in this country have agreed to redeem another sixty or seventy billions of securities and mortgages in gold…knew full well that all of the gold in the United States amounted to only between three and four billions and that all of the gold in all of the world amounted to only about eleven billions. If the holders of these promises to pay started in to demand gold the first comers would get gold for a few days and they would amount to about one-twenty-fifth of the holders of the securities and the currency…We have decided to treat all twenty-five in the same way in the interest of justice and the exercise of the constitutional powers of this Government. We have placed everyone on the same basis in order that the general good may be preserved. 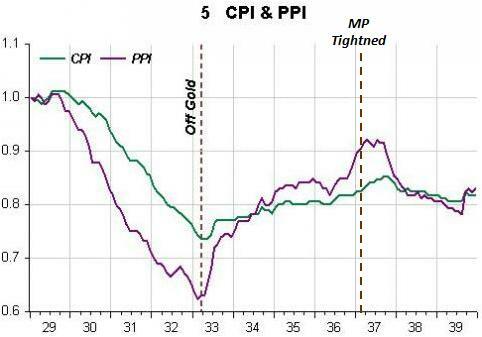 This picture, one of several, from a post of a few months ago that discusses the topic indicates that commodity prices (PPI) was at “striking distance” from FDR´s objective when the Fed, frightened of inflation “getting out of control” tightened MP! The second leg of the Depression (1937-38) followed suit. stabilizing nominal spending growth along a target path. He only thinks in terms of inflation/deflation. A case of self-induced paralysis – as a spirited defense of level targeting. Those of us Democrats who were happy when Barack Obama reappointed Ben Bernanke as Fed Chair thought that we were getting the Ben Bernanke we knew–the student of the Great Depression and of Japan’s Lost Decade dedicated to doing whatever was necessary to stabilize the time path of nominal GDP, up to and including dropping bales of money out of helicopters. on December 2007 having ended on June 2009. There´s certainly not much to celebrate given that the economy is still in the doldrums. You could take Jon Hilsenrath’s article on the GOP’s mounting opposition to the Federal Reserve as a lesson in the downside of extraordinary measures, and thus reason for the Fed to avoid doing more, both now and in the future. But you can also take it in exactly the opposite direction: as a lesson in the downside of policy failure, and a reminder of what happens when you do more without doing enough. As Binyamin Appelbaum writes today, “a number of studies have concluded that the Fed’s efforts have had only a modest impact on the economy.” And that’s not a modest impact on a normal economy. It’s a modest impact on the worst economy since the Great Depression. The anger at the Fed isn’t coming because people have suddenly developed strong and nuanced views on quantitative easing. It’s coming because people are angry about the state of the economy, and the Fed is one of the major forces in the economy. The way to have avoided it wouldn’t have been to do less, but to do better, which would’ve meant doing more. A growing number of economic policymakers — former Fed vice chairman Alan Blinder, former CEA chair Christina Romer, former associate director for the Fed’s monetary affairs division Joseph Gagnon — believe that would’ve been, and in many cases, still is, possible. They argue that the bank’s underwhelming impact on the recovery is evidence not of the Fed’s inability to more effectively fight the recession, but its unwillingness to do what was needed to fight the recession. Larger and more aggressive asset purchases, price-level targeting, and various other dips into unconventional measures were and are needed. But all that would’ve been economically more effective and politically easier a year ago, or even two years ago, than it is today. Today, the Fed is under intense criticism, which limits its freedom of action. Having not done enough, they’re now unable to do more. the pitiful situation at present. seven quarters after the deep recession of 1981-82 (when unemployment peaked at 10.8% (higher than in this recession) and in the seven quarters following the “great” recession of 2007-09. The nominal quantity over which the Fed has strong influence has remained euphemistically timid this time around! with the potential for a lost decade”. By this time around 30 years ago, the employment population ratio had surpassed its level just prior to the start of the recession. At present the economy remains “deep inside the hole”. Seems clear that this has a lot to do (“it ain´t mostly structural”) with the Fed keeping a lid on nominal spending growth! inflation expectations went up significantly during the first seven quarters of recovery. 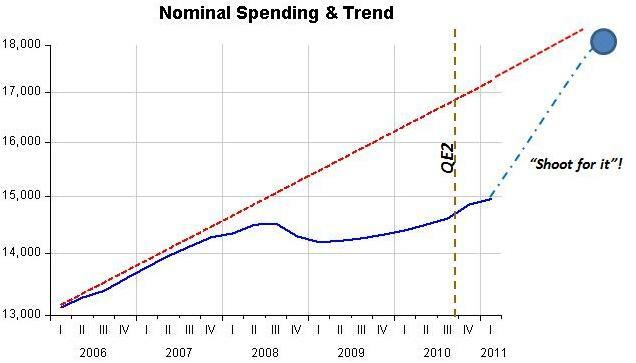 Nominal spending “obliged”! Note that three years later, just as the “Great Moderation” was gathering steam, inflation expectations were on the way down (and kept on falling). This time around they have mostly come down – just the opposite of what´s needed! Until recently, it seemed unlikely that we were headed for a double-dip recession. We were clearly looking at a very slow recovery, especially for employment, but there was little reason to worry about a second recession. slowed sharply. Meanwhile, house prices continue to decline to new post-bubble lows, home sales have slowed, claims for unemployment insurance have risen, and consumer sentiment has weakened. Both stimulus spending and QE2 are coming to an end, state and local budgets are still a problem, and orporate bond issuance “fell to its slowest pace of the year.” The fall in investment activity is particularly worrisome because business investment has been growing at near pre-recession rates and has been a key factor in bringing about the moderate output growth we’ve experienced recently. If business nvestment falls off, it’s hard to see what will replace it. A good example of a complete absence of Commitment! (or the manifestation of the wrong ones). The answer, I suspect, lies in two things. First, in 1998 I was, I think, among the first prominent economists to give voice to the notion that Japan’s experience – deflation that stubbornly refused to go away, despite what looked like very loose monetary policy – was a warning signal. 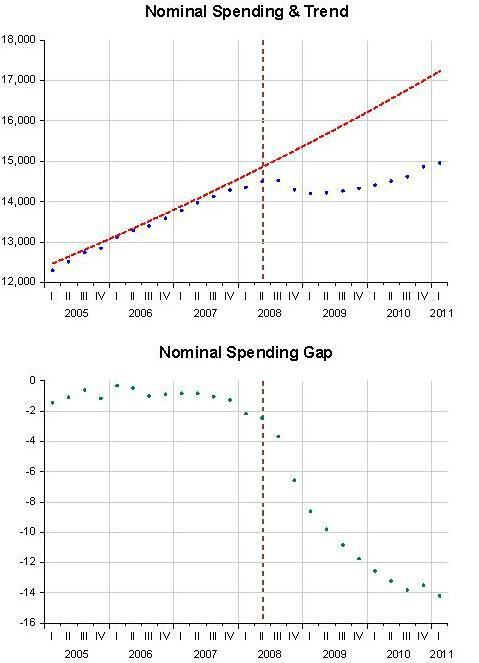 One question I’ve been asked a lot is why I spent 2009 campaigning for fiscal expansion rather than monetary expansion. Well, at the Keynes conference this morning Mike Woodford gave an overview of policy options when you’re up against the zero lower bound that in some ways expressed better than I’ve managed to what I was thinking at the time. First, Mike argued that monetary expansion once you’re at the ZLB mainly works, if it does, through affecting expectations. If people don’t perceive the expansion as representing a change in policy that will persist even after the economy has recovered, even big changes in the monetary base have hardly any effect. Note both that Japan reversed much of the initial expansion in the monetary base, confirming the expectations of those who might have regarded that expansion as temporary – and Japan did this even though deflation continued! Note also that nominal GDP never moved at all despite the huge amount of money “printed”. So what was the right answer? I guess I’d say that if powerful political forces block any effective response to a crisis, there is no effective response to that crisis. NK view that MP is interest rate targeting, so that once the policy rate is “zero” you have to go “somewhere else for help”. Forgetting that FS leaves a “bad aftertaste” while not being of much help. For what it’s worth, I think the major impediment to economic growth at present is uncertainty on the part of the key economic actors, namely businessmen and consumers. Businessmen are hesitant to hire and invest and consumers to spend, in both cases because of uncertainty about their economic prospects. Once again, below the embodiment of “commitment”: State your NGDP Target and “shoot for it”. The best cure for the economy now is time. That’s the overwhelming opinion of leading economists in a new Associated Press survey. They say the Federal Reserve shouldn’t bother trying to stimulate the economy — and could actually do damage if it did. The economists are lowering their forecasts for job creation and economic growth for the rest of this year, mainly because of high oil prices. A batch of bleak data over the past month has suggested that the 2-year-old economic recovery is slowing. longer-term rates low to help spur spending and hiring. The economists say another round of bond-buying wouldn’t provide much benefit, if any. And some fear it could make things worse by unleashing high inflation and disrupting financial markets. 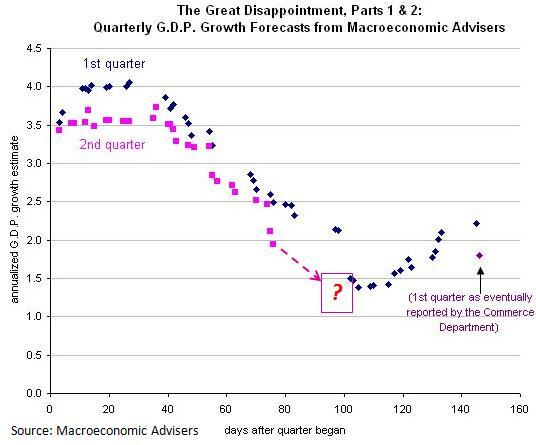 the first quarter as indicated by this nice Macroeconomic Advisors graph – you “wash your hands” and posit that only time can do the healing! 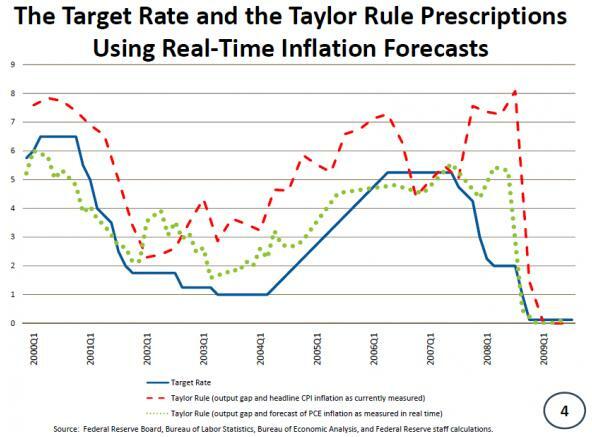 For a long time monetary policy has been “guided” by inflation targeting and Taylor Rules. otherwise things will only get worse! The accumulation of empirical evidence on monetary phenomena, improved understanding of monetary theory, and many other phenomena doubtless played a role. But I believe they were nowhere near as important as the shift in the theoretical paradigm. The MV=Py key to a good thermostat was there all along. New Keynesians have this precisely backward. Interest rates are neither necessary nor sufficient for the monetary policy transmission mechanism. Money/velocity is both necessary and sufficient. The panel below shows the evidence accumulated over the last 50 years. 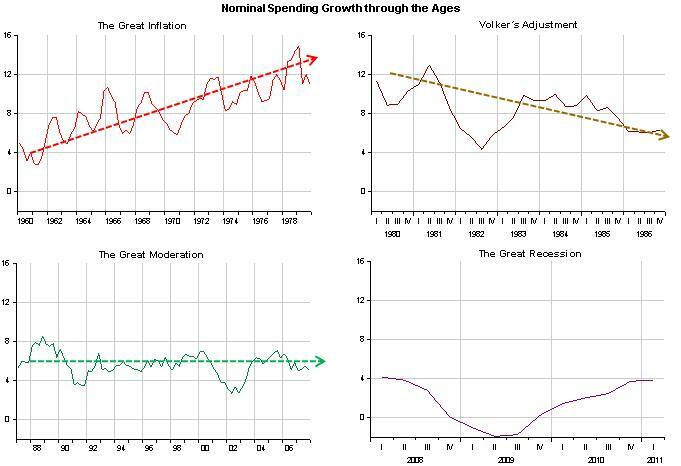 Surely, nominal spending stability (stable growth along a level target path) – The Great Moderation – is the result of a monetary policy conducted according to the principle that money supply should offset changes in velocity, thus keeping nominal spending evolving close to a level growth path. The next picture (shown for the hundredth time) indicates the precise time that the “Thermostat was lost”. It also clearly indicates what the “target” should be to get the economy back on it´s feet! The Fed should be isolated from the real economy and only adjust the supply of money to the demand given a target path for nominal spending. “QED”. I can’t get enthused one way or the other about Ed Balls’ call for a temporary cut in VAT. This is because of a more general point – I’m not sure just how much good or bad any feasible macroeconomic policy can do. Federal Reserve officials are discussing whether to adopt an explicit target for inflation, a strategy long advocated by chairman Ben S. Bernanke and practiced by central banks from New Zealand to Canada, according to people familiar with the discussions. The talks coincide with Fed efforts to spur growth and reduce unemployment without fueling higher prices. An inflation target could help quiet critics of record monetary stimulus and anchor public expectations for consumer prices should the Fed in coming months try to spur the recovery by keeping interest rates close to zero for longer. Which would be done to assuage agents that inflation is uppermost in the Fed´s mind despite keeping rates close to zero for “eternity”! But inflation targeting is a bad choice once inflation has been “conquered”, and the FF rate target is a bad “instrument”. With short-term nominal interest rates constrained by the zero bound, a decline in short-term inflation expectations increases short term real interest rates (that is, the difference between nominal interest rates and expected inflation), thereby damping aggregate demand. Conversely, in such circumstances, an increase in inflation expectations lowers short-term real interest rates, stimulating the economy. Participants noted a number of possible strategies for affecting short-term inflation expectations, including providing more detailed information about the rates of inflation the Committee considered consistent with its dual mandate, targeting a path for the price level rather than the rate of inflation, and targeting a path for the level of nominal GDP. In my previous post I showed that QE2 mostly affected inflation expectations (temporarily). Adopting a NGDP Level Target would strongly affect spending, which is what is needed. 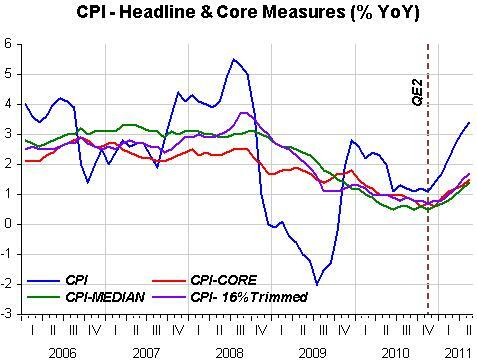 The Fed did QE2 and it got inflation and inflation expectations up. 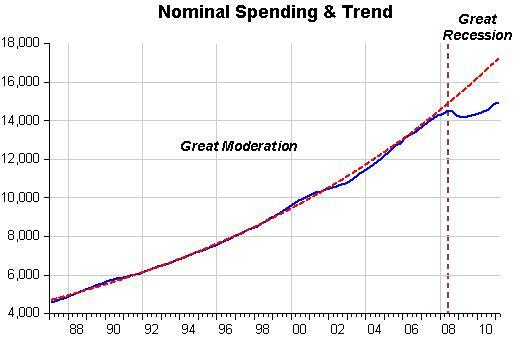 But it did virtually nothing to aggregate nominal spending (see pictures). As a result it became a “lightening rod for criticism” (in the words of David Beckworth), like this manifestation from Raghuram Rajan. In order to get monetary stimulus really going and effective the Fed needs urgently to establish a nominal level target…and shoot for it!